It's only the 5th December and the Xmas parties are already in full force. Last night when I was coming home from a party myself, I spotted a rather tired reveller (I love that word, even though it has nothing to do with the chocolate treats). 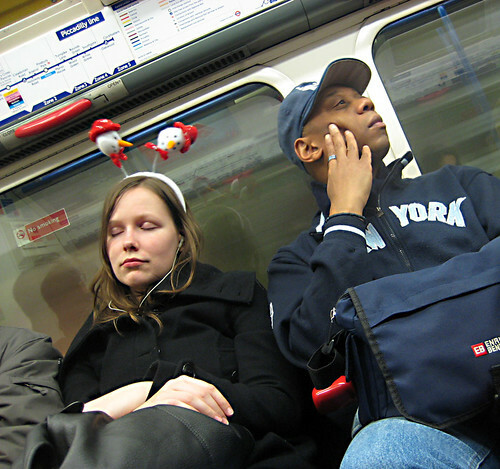 She's wearing a rocking pair of Christmas snowmen Deeley Bopppers, while gently nodding off to her iPod tunes. However, she was only dozing and didn't need any of the "Wake me up at XXXXX" stickers or other tricks needed to get you off at the correct London Underground stop. The Wake Me Up at XXXX station stickers actually make brilliant Secret Santa presents or Xmas stocking fillers. They're only four quid (including postage) and I've put bagged them for Secret Santa gifts in the past. However, I've not actually seen anyone wearing one yet! Expect to see other signs of Christmas on the Tube over the coming days and if you have any thoughts or images of what Xmas on the London Underground means to you, I'd love to hear or see them.